When I first started knitting a year ago, my friend Tasha sent me a link to a pattern for Coffee Cup Sleeves. These sleeves wrap around your take out coffee cup (or non-handled travel mug) so that your hands are protected from the burning hot coffee. If you carry your coffee sleeve with you, you'll never have to use the disposable ones from your favourite Coffee Shop. This project is practical and eco-friendly! When I first saw it, I knew this pattern was awesome, but I hadn't had a chance to try it out until now. 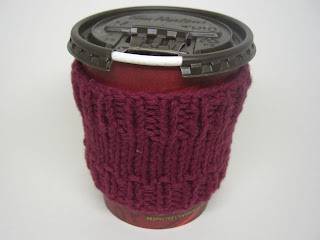 The Coffee Cup Sleeve is a quick project to complete and you could probably make two in an evening, depending on your ability to work through distractions. I am still relatively new to knitting, so I still find it difficult to concentrate on knitting and anything else at the same time. If there is a movie on, my hands frequently stop moving if I am focusing on a scene. Also, I still haven't mastered the art of knowing how many rows I have made in a certain stitch so I really have to focus on keeping track. I often use a cheat sheet and check off each row I complete, so if I am doing 10 rows of Stockinette Stitch, I write the numbers 1 through 10 on a piece of paper and check off each row as I finish it. I'm not sure if this is how expert knitters do it, but it works for me. I really like this pattern because it is easy and practical. My mom now has one in her purse and I went out and got myself a Tim Horton's just so I could try mine out. I like when my reward for knitting is Tim Horton's! Cheat sheets are fine! We all use 'em. Welcome to the obsessive world of knitting!